The internet has always been a playground for juxtaposition, a safe space where contradicting genres can procreate to make cultural Ligers. 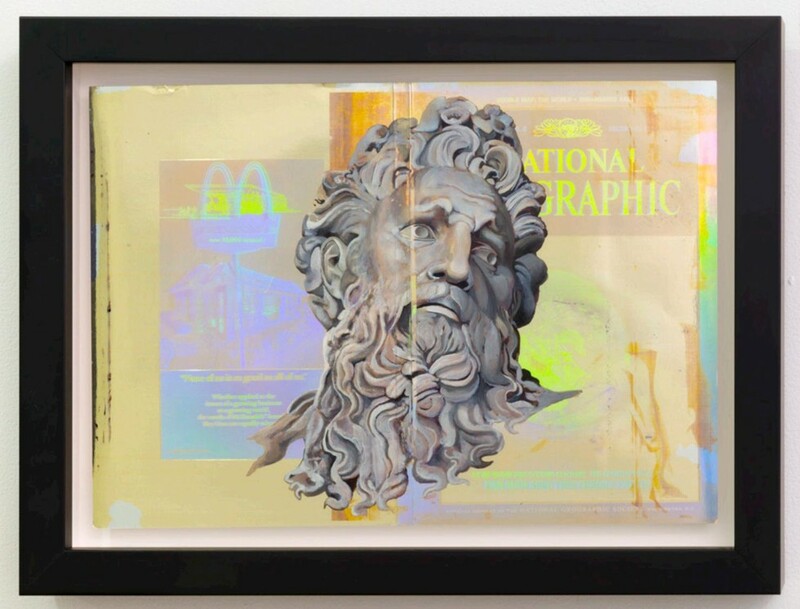 New York-based artist (and PAPER beautiful person) Jeanette Hayes has been a member of this digital genus for years, bringing art, fashion and meme culture together, shaking them wildly, and producing them with overwhelming technical skill onto a canvas, IRL. She's made GIFS for Proenza Schouler, a mini art mag for Purple, a short film of a year of iPhone videos, and countless paintings and drawings that put pop culture and fine art together in one image (think Sailor Moon posing next to Picasso's Demoiselles d'Avignon). This time, for her newest solo show PARADICE?? 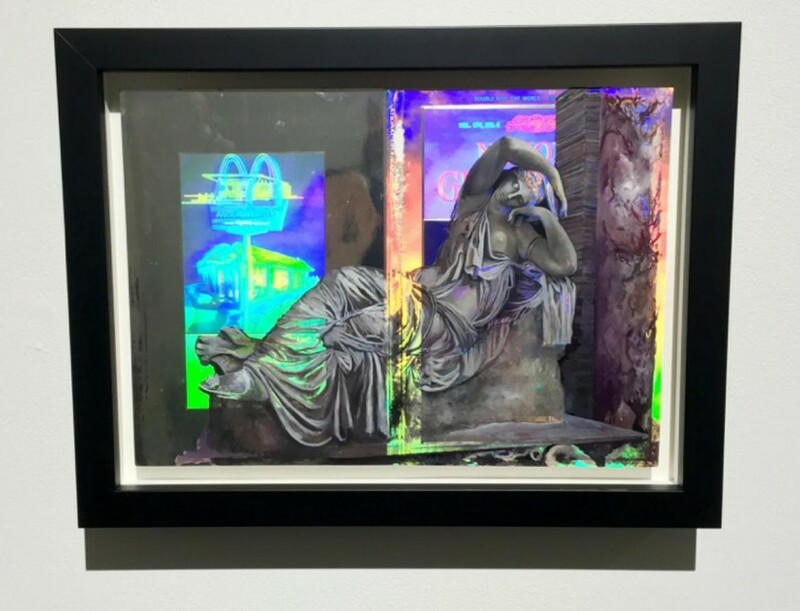 at Lower East Side's Castor Gallery, Hayes has painted images from The Renaissance on top of a near opposite medium, a hologram background that emits a Y2K nostalgia of technicolor stickers, 3D baseball cards, and National Geographic special edition covers. Instead of blending together to make a fluid image, these elements counteract each other with their aesthetic and historic differences, creating a whole new genre of itself. 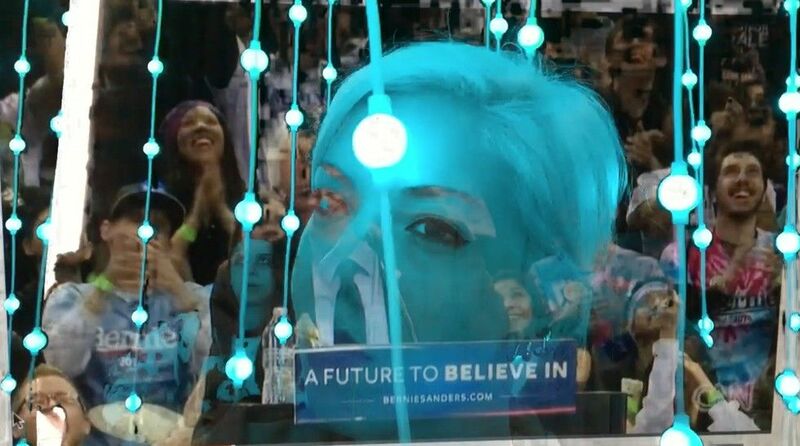 From working as an intern the Holographic Studios to remixing that piano cat video with Taylor Swift's infamous Grammy disaster, we talk to Hayes about the memes and materials that make her work in a field of its own. Where do you feel you fit in the spectrum of internet and art? Do you consider yourself an "Internet Artist?" I consider myself just an artist -- an artist who uses the internet. But find me an artist my age who doesn't use the internet (or actually, don't, please). The internet is an integral part of our lives so it seeps into my work sometimes. I'm a painter, but I draw and make videos and one day want to write books and breed animals and design cars. 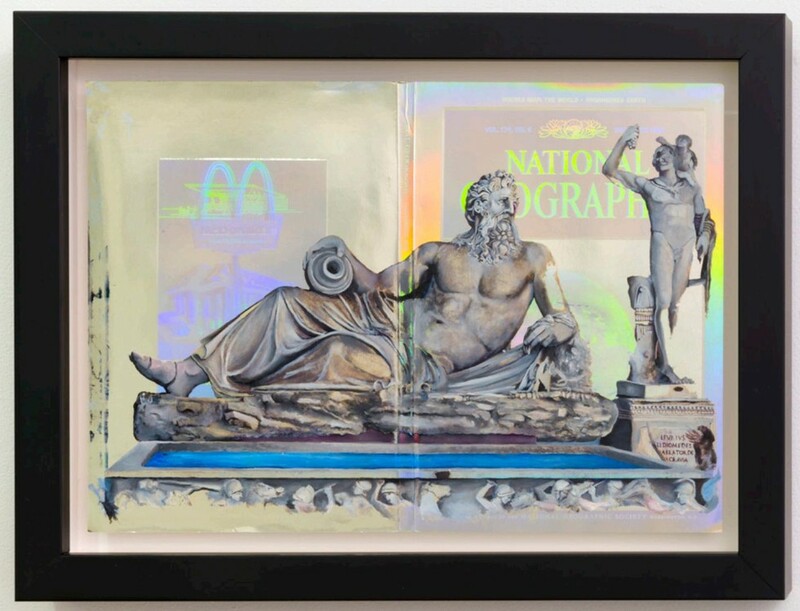 Your new work uses a lot of holograms as canvas for classic oil paintings. 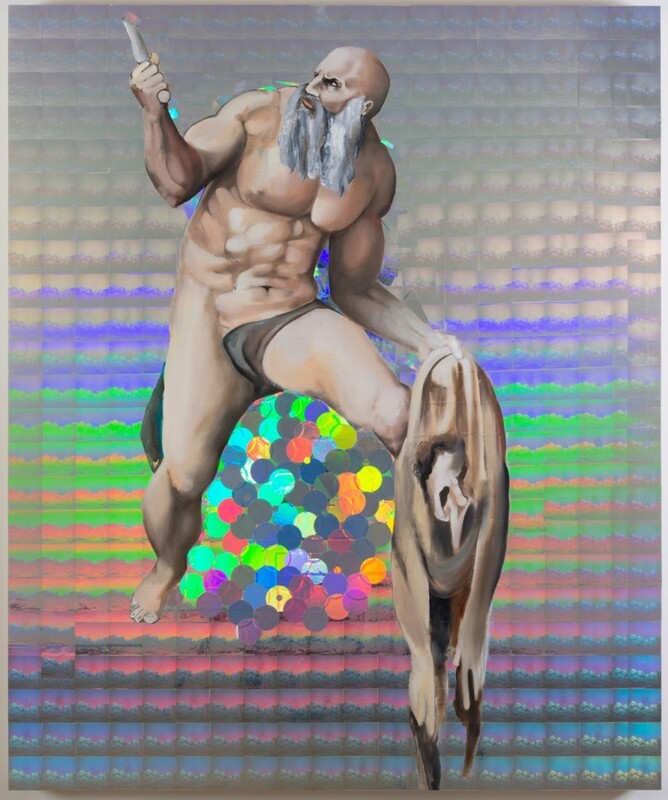 How did you start working with holographic materials and why did you choose these particular images to paint on top? My first internship was at the Holographic Studios on 26th Street working for Dr. Laser. 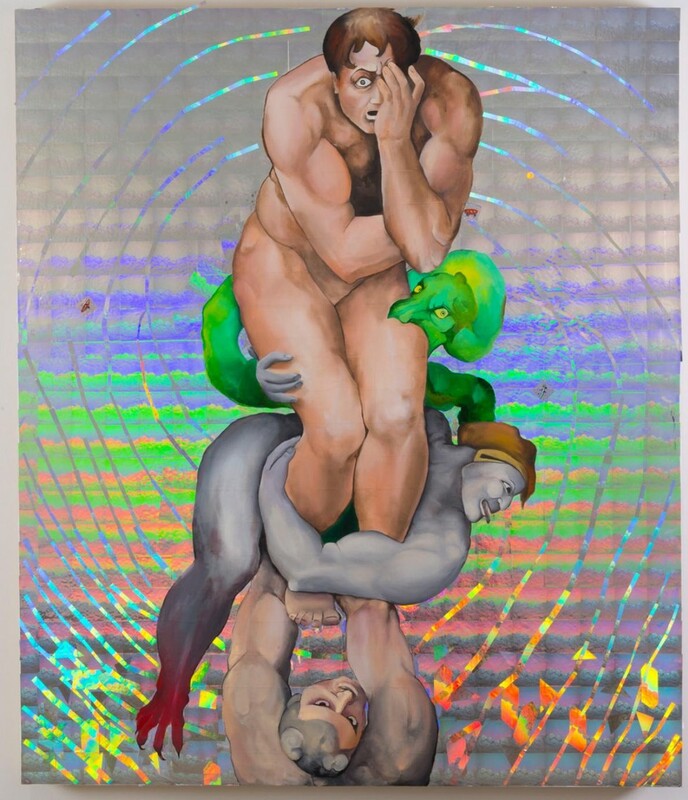 I've always had an interest in holographic imagery but the paintings I made for this show were the first time I incorporated holograms into my work. The holograms I painted on are of lots of different images. In the darker paintings the holograms (in my mind) are mocking the painted figures, taunting them and laughing -- they're clowns. 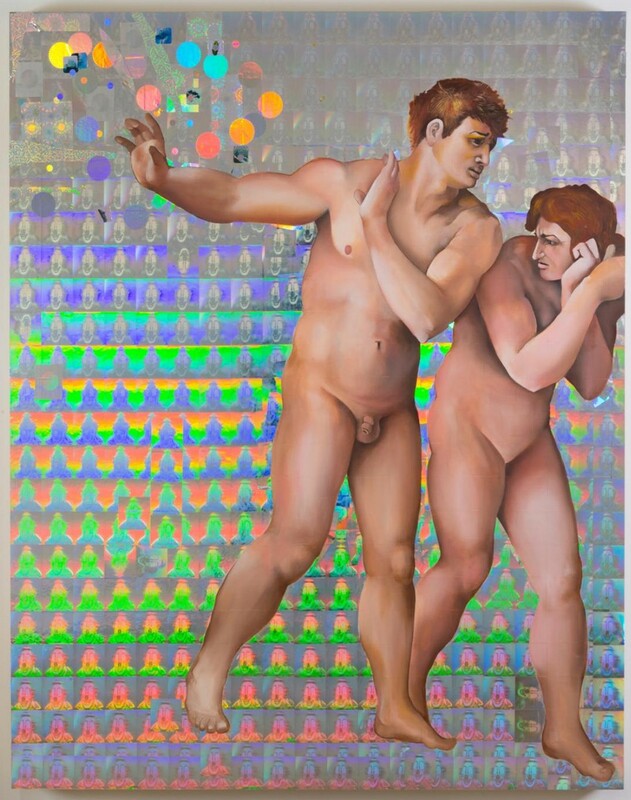 The purpose of the holograms were mostly for the light prisms and how they make a viewer interact with the painting. You have to move around the work to see it change. Click below for images from PARADISE?? Can you talk about your iPhone video piece in the basement? How much is your content and how much of it is sourced? It's mostly all my content except for two videos I shot from YouTube videos. Every year for the last four years I've made an annual video that compiles my favorite videos that I shot on my phone. Last year I exhibited the third of this series at Ellie Rine's 55 Gansevoort gallery. The videos are like my diary entries -- excerpts are pulled to make a short story. It's a glimpse into my brain. Are you looking for something when you take these videos? What did you want to portray? I take so many videos with my phone that it's hard to even go back and organize the footage. I shoot constantly, just because everything looks good all of the time -- or disgusting or confusing or I just want to remember it. I wish I had those contact lenses that constantly film what you're seeing. For each video I make in this series, there is a very slight theme. For this video at Castor gallery, that theme was about light, color and collage. I wanted it to be part of a conversation with the paintings. Also, the drawings. What are your main influences or obsessions right now? This morning I went to that unfinished works show at the Met Breuer. I think that's my favorite show I've seen in NYC in a long time, if not ever. My obsession for that show has just begun. I also just got HBOGo so I've been a bit obsessive about TV lately. Do you see the internet and art being more compatible in the future? What does that look like to you? I'm not sure. A lot of times I'm not so into art made about the internet -- unless it's just for the internet. It's kind of "stop trying to make fetch happen" vibes. Every once in awhile it's done in a beautiful way and I think it's fantastic, but that can be said about anything. I don't really care about horse paintings, but Delacroix sure painted some fabulous horses. What was the first meme that you were really into? PARADISE?? at Castor Gallery will be on view until May 7, 2016.